Microsoft Outlook is being used by a large number of users owing to its efficient emailing, contact and task management, journals, appointments etc. Being a desktop client application, it saves the entire data contents in the PST file(Personal Storage Table). This file is responsible for maintaining entire record of Outlook data. However, Outlook users generally face a common issue where the PST file gets corrupted. The corruption of data file also hampers the working of Outlook as it becomes unable to retrieve or access data from its PST file. Also, several demands to restore permanently deleted Outlook emails have been reported. Since, these files are repository of entire Outlook account, users always look for an alternate to recover data from Outlook. Only the third party software can help to recover PST file for an Outlook account. One such software is Outlook PST Recovery, which proposes to recover Outlook data files without any data loss. The software has been tested by our experts to evaluate its working and proposed features. This article is aimed to provide a transparent review for Outlook recovery software so that the users can judge the use of software according to the observations. In this article you’ll get to know the variant features of awesome Repair utility which is built especially for the business oriented people. The PST file recovery software facilitates to recover Outlook shift deleted items such as emails, contacts, tasks, calendars, journals etc in the folder hierarchy. Thus, it can be used to recover permanently deleted Outlook folders. The advance scan of PST Recovery tool offers to repair corrupted PST file without any kind of data loss or data alteration issue. It provides complete solution to restore Outlook contacts, emails etc from corrupted PST. The PST repair tool provides an option to save the scanned PST file on local system. The saved scanned file can be directly loaded to the tool in future. It saves the time of scanning the same PST file again and again. Once the scanning of PST is complete, the Outlook repair tool generates a preview of recovered Outlook items. The user can choose to view any data items: emails, contacts, calendar, tasks, appointments etc without any formatting issue. The users can view the extracted emails and attachments from the scanned PST file in a normal mail view format. It displays all parameters of emails: From, To, CC, Body, Subject etc. The Outlook PST file Recovery tool facilitates to export the selected emails in group, contacts, tasks etc into the required file format. Thus, a complete freedom is provided to export Outlook PST to convenient file formats. The PST recovery tool is equipped with a very helpful feature that allows the user to export emails on the basis of date filtering. It exports all the emails for the specified time interval. The export to PST feature is further customized to let the user split large PST file into the smaller sized PSTs. The user can choose the size of PST files according to the requirement. The Outlook recovery software permits the user to save the CSV file in the local system. This file can be used to track the export status of the recovered PST file. PST Recovery is a stand alone tool i.e., it does not require any additional plug in or Outlook installation for its working. It can recover data from Outlook PST file without MS Outlook installation. Export PST to EML/MSG format offers multiple naming conventions for the emails. Depending upon the convenience, the user can choose to extract the emails in a particular order. Outlook PST file repair tool supports to recover Outlook data items from any sized PST file. It odes not impose any certain kind of limitation on the maximum file size of PST that is to be recovered. All the Outlook folders from the PST file are scanned in a way that the folder hierarchy is retained. It helps the user to easily locate the extracted data within the specified folder. In addition to above discussed features, the recovery tool is equipped with certain features which cannot be neglected. Some of the features include folder hierarchy maintenance, switching views, preferred location for output file etc. How does Outlook PST Recovery Tool Work? Once you’ve downloaded the software, run it >> after the tool is open, Select the PST file, which needs to be recovered by the tool. Choose whether to save scanned PST file on local system or not. Preview the recovered data items from folder list. View the restored emails and associated attachments by clicking on Normal Mail View or Attachments option. Check mark the required data items to be exported. Click on Export option from the title bar. Choose to export the selected items into required format: PST/MSG/EML. 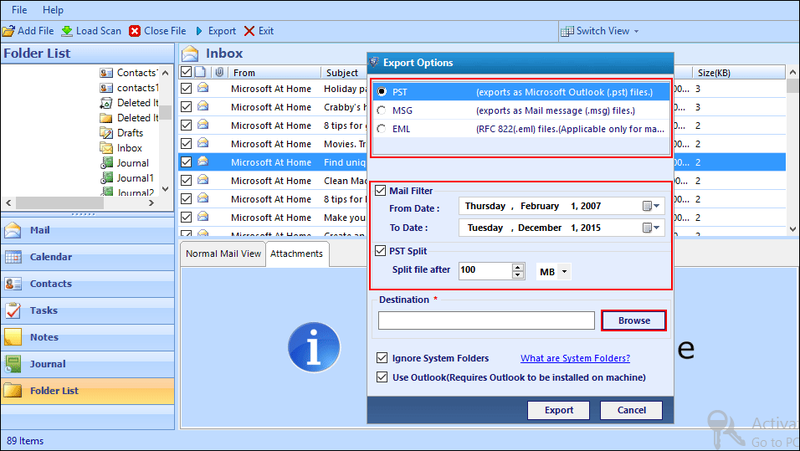 Apply the mail filter(Optional)– If you wish to filter the emails on the basis of emails, then enter the dates for which the emails need to be exported. PST Split(Optional)– If you have chosen to export the selected Outlook data to PST format, then you can avail an option to split the large sized PST into smaller PSTs. It leads to easy management of files. Destination– Choose the preferred location for exporting the newly generated output file. Once the export is completed, the tool generates an export report in CSV format. You can choose to save this file for future record tracking for the export operation. Demo Version– The free Outlook file Recovery software can be downloaded from the website at free of cost. It offers the user to recover permanently deleted emails from PST file. The corrupted PST files can also be easily handled to recover its contents. Moreover, 25 items per folder can be extracted to required file format: PST/MSG/EML. Licensed Version– The advance version of PST file recovery tool can be purchased from company’s official website. In addition to open corrupted PST file and permanently deleted data recovery, the tool offers to split large sized PST to smaller PSTs. It offers to export any number Of selected data items to PST/MSG/EML format. Operating System Requirement– The tool is compatible to recover PST files in Windows 10 and all below versions. Mounted RAM– At least 512 MB RAM should be mounted on system. However, 1 GB RAM is recommended by the experts. Installed Processor– 1 GHz processor must be installed on system for efficient working of the Outlook Recovery tool. To experience faster processing, 2.4 GHz processor is suggested. Hard Disk Space– At least 60 MB free disk space is necessary for installation of Outlook Recovery software. Even the permanently deleted data items can be restored by using Outlook Recovery tool. It provides an option to save the scanned PST file, which can be loaded any time to preview its contents. Thus, it saves time of rescanning the file. The Outlook PST file recovery software allows to recover a single PST file at a moment. The bulk recovery of PST files is not supported by the tool. After analyzing the PST Recovery Tool for different parameters, our expert team has reached to a conclusion that the tool caters to meet recovery demands of all Outlook users. It can easily meet data recovery expectations in all terms: efficiency, performance, scalability, quality and other parameters. The tool can be used to recover and export Outlook data from corrupted PST files without any data loss. Moreover, hard deleted Outlook items can also be easily restored. Considering all pros and cons, the software can be rated as 9.6 on a scale of 10 as the bulky recovery of PST files is not provided by the tool.